This week at the Bedford + Bowery Newsroom: bang your head on the punk rock! These two screenings pair some of our favorite documentarians with the outré — and outrageous — musicians they’ve filmed over the years. As always, the events are free — just let us know you’re coming via the Facebook event links below. WEDNESDAY, OCT. 2, 7 P.M.
Last time we saw Adam Green, the singer-songwriter who co-founded of The Moldy Peaches, he was installing a giant cat sarcophagus in an East Village window and plotting a papier-mâché remake of “Aladdin” starring Macauly Culkin. If that made you wonder what makes the man tick, then you’ll definitely want to catch Wednesday’s screening of “How to Act Bad,” a documentary that follows Green over the course of two years, offering a candid and often comical look into his paintings and sculptures, drug experimentations, filmmaking and romantic dysfunctions. After the screening Green himself, along with filmmaker Dima Dubson, will be on hand to teach you how to act bad. Consider this a killer warm-up to next week’s CBGB Festival. Pat Ivers and Emily Armstrong spent the late ‘70s filming performances at places like CBs, Mudd Club and Danceteria, and amassing an archive that’s currently being digitized for the NYU Fales Library’s Downtown Collection. Readers of Bedford + Bowery have seen clips from Richard Hell and the Voidoids, the NYC debut of the Dead Kennedys, and even Iggy Pop covering Sinatra. On Friday, you’ll see rare gems from the Nightclubbing archive like you’ve never seen ’em before — on the big screen, with the sound turned up. After the screening, Ivers and Armstrong will chat with Richard Boch, an artist and writer currently working on a memoir about his nearly two years working the door at Mudd Club, and Pat Irwin, a founding member of The Raybeats and Eight Eyed Spy who later joined The B-52s and currently scores TV shows and movies for Showtime, HBO, and others. 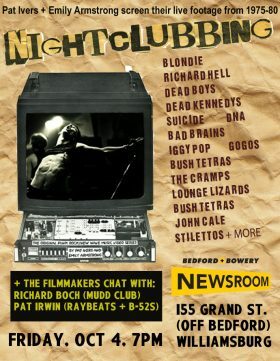 All events at the Bedford + Bowery Newsroom, 155 Grand, off of Bedford Ave.